Sir Timothy John Berners-Lee OM KBE FRS FREng FRSA FBCS (born 8 June 1955), also known as TimBL, is an English engineer and computer scientist, best known as the inventor of the World Wide Web. He is currently a professor of computer science at the University of Oxford and the Massachusetts Institute of Technology (MIT). He made a proposal for an information management system on March 12, 1989, and he implemented the first successful communication between a Hypertext Transfer Protocol (HTTP) client and server via the internet in mid-November the same year. Berners-Lee is the director of the World Wide Web Consortium (W3C), which oversees the continued development of the Web. 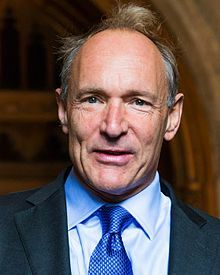 He is also the founder of the World Wide Web Foundation and is a senior researcher and holder of the 3Com founders chair at the MIT Computer Science and Artificial Intelligence Laboratory (CSAIL). He is a director of the Web Science Research Initiative (WSRI), and a member of the advisory board of the MIT Center for Collective Intelligence. In 2011, he was named as a member of the board of trustees of the Ford Foundation. He is a founder and president of the Open Data Institute, and is currently an advisor at social network MeWe. Berners-Lee was born in London, England, United Kingdom, one of four children born to Mary Lee Woods and Conway Berners-Lee; his brother Mike is an expert on greenhouse gases. His parents worked on the first commercially built computer, the Ferranti Mark 1. He attended Sheen Mount Primary School, and then went on to attend south west London's Emanuel School from 1969 to 1973, at the time a direct grant grammar school, which became an independent school in 1975. A keen trainspotter as a child, he learnt about electronics from tinkering with a model railway. He studied at The Queen's College, Oxford, from 1973 to 1976, where he received a first-class bachelor of arts degree in physics. While he was at university, Berners-Lee made a computer out of an old television set, which he bought from a repair shop. Berners-Lee wrote his proposal in March 1989 and, in 1990, redistributed it. It then was accepted by his manager, Mike Sendall, who called his proposals 'vague, but exciting'. He used similar ideas to those underlying the ENQUIRE system to create the World Wide Web, for which he designed and built the first Web browser. His software also functioned as an editor (called WorldWideWeb, running on the NeXTSTEP operating system), and the first Web server, CERN HTTPd (short for Hypertext Transfer Protocol daemon). info.cern.ch was the address of the world's first-ever website and web server, running on a NeXT computer at CERN. The first webpage address was http://info.cern.ch/hypertext/WWW/TheProject.html, which centred on information regarding the WWW project. Visitors could learn more about hypertext, technical details for creating their own webpage, and even an explanation on how to search the Web for information. There are no screenshots of this original page and, in any case, changes were made daily to the information available on the page as the WWW project developed. You may find a later copy (1992) on the World Wide Web Consortium website. It provided an explanation of what the World Wide Web was, and how people could use a browser and set up a web server, as well as how to get started with your own website. 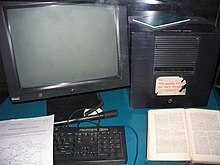 In a list of 80 cultural moments that shaped the world, chosen by a panel of 25 eminent scientists, academics, writers, and world leaders, the invention of the World Wide Web was ranked number one, with the entry stating, "The fastest growing communications medium of all time, the internet has changed the shape of modern life forever. We can connect with each other instantly, all over the world". In June 2009, then-British prime minister, Gordon Brown, announced that Berners-Lee would work with the UK government to help make data more open and accessible on the Web, building on the work of the Power of Information Task Force. Berners-Lee and Professor Nigel Shadbolt are the two key figures behind data.gov.uk, a UK government project to open up almost all data acquired for official purposes for free re-use. 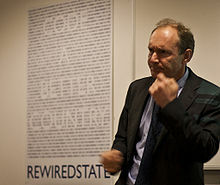 Commenting on the opening up of Ordnance Survey data in April 2010, Berners-Lee said that: "The changes signal a wider cultural change in government based on an assumption that information should be in the public domain unless there is a good reason not to—not the other way around." He went on to say: "Greater openness, accountability and transparency in Government will give people greater choice and make it easier for individuals to get more directly involved in issues that matter to them." On 30 September 2018, Berners-Lee announced a new application made by open-source startup Inrupt based on the Solid standards, which aims to give users more control over their personal data and lets users choose where the data goes, who's allowed to see certain elements and which apps are allowed to see that data. Berners-Lee married Nancy Carlson, an American computer programmer, in 1990; she was also working in Switzerland, at the World Health Organization. They had two children and divorced in 2011. He formed a relationship with Rosemary Leith, a Canadian internet and banking entrepreneur. Leith studied business at Queen's University, then moved to Britain to pursue a career in investment and analysis. She worked in the City of London as a principal investor prior to 2000. She was married to Mark Opzoomer, later the CEO of Rambler Media; the couple had three children, after which she left the financial sector, co-founding a start-up during the dot-com bubble. Management Today described her webzine (as it was called then) as "the first web site devoted entirely to those women struggling to strike a healthy balance between work and home life". More recent projects span both finance and internet. In 2011, she chaired the World Economic Forum Global Agenda Council for the Future of Internet Security and from 2015 she has been on the board of YouGov. She is on the advisory board for funding platform AllBright, to support "female entrepreneurs from start-ups to established businesses", and provided funding to Netwealth Investments Ltd. Leith is a fellow at Harvard University's Berkman Klein Center for Internet & Society. In 2014, Berners-Lee and Leith married at the Chapel Royal, St. James's Palace in London. The couple collaborate on projects such as venture capital to support artificial intelligence companies. Leith is a founding director of the World Wide Web Foundation. a non-profit organisation Berners-Lee launched. Berners-Lee was raised as an Anglican, but in his youth, he turned away from religion. After he became a parent, he became a Unitarian Universalist (UU). He has stated: "Like many people, I had a religious upbringing which I rejected as a teenager ... Like many people, I came back to religion when we had children". He and his wife wanted to teach spirituality to their children, and after hearing a Unitarian minister and visiting the UU Church, they opted for it. He is an active member of that church, to which he adheres because he perceives it as a tolerant and liberal belief. He has said: "I believe that much of the philosophy of life associated with many religions is much more sound than the dogma which comes along with it. So I do respect them." In 2017 Berners-Lee was criticized for approving Encrypted Media Extensions, a standard seen by prominent defenders of Internet freedom, such as the Free Software Foundation, as dangerous by helping to implement DRM. ^ a b "Fellowship of the Royal Society 1660–2015". London: Royal Society. Archived from the original on 15 July 2015. ^ "Sir Tim Berners-Lee joins Oxford's Department of Computer Science". University of Oxford. ^ "Tim Berners-Lee | MIT CSAIL". www.csail.mit.edu. ^ "30 years on, what's next #ForTheWeb?". World Wide Web Foundation. ^ "info.cern.ch – Tim Berners-Lee's proposal". Info.cern.ch. Retrieved 21 December 2011. ^ Tim Berners Lee's own reference. The exact date is unknown. ^ Berners-Lee, Tim; Mark Fischetti (1999). Weaving the Web: The Original Design and Ultimate Destiny of the World Wide Web by its inventor. Britain: Orion Business. ISBN 978-0-7528-2090-3. ^ Berners-Lee, T. (2010). "Long Live the Web". Scientific American. 303 (6): 80–85. doi:10.1038/scientificamerican1210-80. PMID 21141362. ^ Shadbolt, N.; Berners-Lee, T. (2008). "Web science emerges". Scientific American. 299 (4): 76–81. doi:10.1038/scientificamerican1008-76. PMID 18847088. ^ Berners-Lee, T.; Hall, W.; Hendler, J.; Shadbolt, N.; Weitzner, D. (2006). "Computer Science: Enhanced: Creating a Science of the Web". Science. 313 (5788): 769–771. doi:10.1126/science.1126902. PMID 16902115. ^ "Draper Prize". Massachusetts Institute of Technology. Retrieved 25 May 2008. ^ "People". The Web Science Research Initiative. Archived from the original on 28 June 2008. Retrieved 17 January 2011. ^ "MIT Center for Collective Intelligence (homepage)". Cci.mit.edu. Retrieved 15 August 2010. ^ "MIT Center for Collective Intelligence (people)". Cci.mit.edu. Archived from the original on 11 June 2010. Retrieved 15 August 2010. ^ Bratt, Steve (29 September 2011). "Sir Tim Berners-Lee Named to the Ford Foundation Board". World Wide Foundation. Retrieved 22 August 2017. ^ Shukman, Harry; Bridge, Mark (8 January 2019). "Sir Tim Berners-Lee's app MeWe is used by neo-Nazis and perverts". The Times. ISSN 0140-0460. Retrieved 12 March 2019. ^ a b c "Web's inventor gets a knighthood". BBC News. 31 December 2003. Retrieved 10 November 2015. ^ a b "Creator of the web turns knight". BBC News. 16 July 2004. Retrieved 10 November 2015. ^ "Timothy Berners-Lee Elected to National Academy of Sciences". Dr. Dobb's Journal. Retrieved 9 June 2009. ^ "72 New Members Chosen By Academy" (Press release). United States National Academy of Sciences. 28 April 2009. Retrieved 17 January 2011. ^ a b Friar, Karen (28 July 2012). "Sir Tim Berners-Lee stars in Olympics opening ceremony". ZDNet. Retrieved 28 July 2012. ^ a b Berners-Lee, Tim (27 July 2012). "This is for everyone". Twitter. Retrieved 28 July 2012. ^ a b "A. M. Turing Award". Association for Computing Machinery. 2016. Retrieved 4 April 2017. ^ a b c d "Berners-Lee Longer Biography". World Wide Web Consortium. Retrieved 18 January 2011. ^ "Lunch with the FT: Tim Berners-Lee". Financial Times. ^ a b c "He caught us all in the Web!". The Hindu. 1 September 2018. ISSN 0971-751X. Retrieved 2 September 2018. ^ "Berners-Lee's original proposal to CERN". World Wide Web Consortium. March 1989. Retrieved 25 May 2008. ^ a b Stewart, Bill. "Tim Berners-Lee, Robert Cailliau, and the World Wide Web". Retrieved 22 July 2010. ^ a b Berners-Lee, Tim. "Frequently asked questions". World Wide Web Consortium. Retrieved 22 July 2010. ^ Grossman, Wendy (15 July 1996). "All you never knew about the Net ...". The Independent. ^ Berners-Lee, Tim. "Answers for Young People". World Wide Web Consortium. Retrieved 25 May 2008. ^ "Visionary of the Internet". www.achievement.org. American Academy of Achievement. 22 June 2007. ^ "Ten Years Public Domain for the Original Web Software". CERN. Retrieved 21 July 2010. ^ Gromov, Gregory, Roads and Crossroads of Internet History, Chapter 4: Birth of the Web > 1990. ^ "Tim Berners-Lee. Confirming The Exact Location Where the Web Was Invented". davidgalbraith.org. 8 July 2010. ^ "The World Wide Web project". cern.ch. Retrieved 29 March 2016. ^ "Welcome to info.cern.ch, the website of the world's first-ever web server". CERN. Retrieved 25 May 2008. ^ "World Wide Web—Archive of world's first website". World Wide Web Consortium. Retrieved 25 May 2008. ^ "World Wide Web—First mentioned on USENET". 6 August 1991. Retrieved 25 May 2008. ^ "The original post to alt.hypertalk describing the WorldWideWeb Project". Google Groups. 9 August 1991. Retrieved 25 May 2008. ^ "80 moments that shaped the world". British Council. Archived from the original on 30 June 2016. Retrieved 13 May 2016. ^ "Patent Policy—5 February 2004". World Wide Web Consortium. 5 February 2004. Retrieved 25 May 2008. ^ Klooster, John W., (2009), Icons of Invention: the makers of the modern world from Gutenberg to Gates, ABC-CLIO, p. 611. ^ Berners-Lee, T.; Hendler, J.; Lassila, O. (2001). "The Semantic Web". Scientific American. 2841 (5): 34. doi:10.1038/scientificamerican0501-34. ^ "Tim Berners-Lee, World Wide Web inventor, to join ECS". World Wide Web Consortium. 2 December 2004. Retrieved 25 May 2008. ^ "Berners-Lee 'sorry' for slashes". BBC. 14 October 2009. Retrieved 14 October 2009. ^ "Tim Berners-Lee". World Wide Web Consortium. 10 June 2009. Retrieved 10 July 2009. ^ "Ordnance Survey offers free data access". BBC News. 1 April 2010. Retrieved 3 April 2009. ^ FAQ—World Wide Web Foundation. Retrieved 18 January 2011. ^ Ghosh, Pallab (15 September 2008). "Web creator rejects net tracking". BBC. Retrieved 15 September 2008. Warning sounded on web's future. ^ Cellan-Jones, Rory (March 2008). "Web creator rejects net tracking". BBC. Retrieved 25 May 2008. Sir Tim rejects net tracking like Phorm. ^ Adams, Stephen (March 2008). "Web inventor's warning on spy software". The Daily Telegraph. London. Retrieved 25 May 2008. Sir Tim rejects net tracking like Phorm. ^ Berners, Tim (December 2010). "Long Live the Web: A Call for Continued Open Standards and Neutrality". Scientific American. Retrieved 21 December 2011. ^ "State.com/about/people". Archived from the original on 4 March 2016. Retrieved 9 September 2013. ^ Computing, Government (23 May 2012). "Government commits £10m to Open Data Institute". The Guardian. ^ Gibbs, Samuel (7 October 2013). "Sir Tim Berners-Lee and Google lead coalition for cheaper internet". The Guardian. Retrieved 8 October 2013. ^ Weinberger, David, "How the father of the World Wide Web plans to reclaim it from Facebook and Google". Digital Trends, 10 August 2016. Retrieved 31 October 2016. ^ "Sir Tim Berners-Lee joins Oxford's Department of Computer Science". UK: University of Oxford. 27 October 2016. ^ "Sir Tim Berners-Lee joins Oxford's Department of Computer Science and Christ Church". UK: Christ Church, Oxford. 27 October 2016. Retrieved 14 November 2016. ^ "Tim Berners-Lee project gives you more control over web data". Engadget. Retrieved 30 September 2018. ^ "Nancy Carlson Is Wed to Timothy Berners-Lee". Retrieved 22 June 2018. ^ a b "WEB WISE WOMEN: The founders of Flametree – a webzine, interactive forum and source of information for working women – know all about the daily work/life struggle. They're living it themselves, from concept to start-up. Rob Brown reports". Retrieved 23 June 2018. ^ Eden, Richard (22 May 2011). "Internet pioneer Sir Tim Berners-Lee casts a web of intrigue with his love life". Retrieved 22 June 2018. ^ "Rosemary Leith Leads Discussions on Internet Security at the World Economic Forum Global Summit". World Wide Web Foundation. Retrieved 22 June 2018. ^ "YouGov strengthens its board", Interactive Investor, 21 January 2015. ^ "AllBright launches to fund female-led companies in UK". www.talkingnewmedia.com. Retrieved 22 June 2018. ^ "High profile investors inject £10m into Netwealth". Wealth Manager. Retrieved 22 June 2018. ^ "Rosemary Leith | Berkman Klein Center". cyber.harvard.edu. Retrieved 22 June 2018. ^ "Ms Rosemary Leith and Sir Tim Berners-Lee are delighted to announce that they celebrated their marriage on 20 June 2014...." World Wide Web Foundation. ^ "VC firm Glasswing names Jibo, John Hancock execs to advisory board". www.bizjournals.com. 8 May 2018. Retrieved 22 June 2018. ^ "Rosemary Leith". World Wide Web Foundation. Retrieved 23 June 2018. ^ "Faces of the week". ^ a b Berners-Lee, Tim. 1998. The World Wide Web and the "Web of Life". ^ Stephanie Sammartino McPherson. 2009. Tim Berners-Lee: Inventor of the World Wide Web. Twenty-First Century Books, p. 83: "A Church Like The Web". ^ Eden, Richard. 22 May 2011. "Internet pioneer Sir Tim Berners-Lee casts a web of intrigue with his love life", The Telegraph. ^ "Web inventor gets Queen's honour". BBC. 13 June 2007. Retrieved 25 May 2008. ^ "Scientific pioneers honoured by The University of Manchester". manchester.ac.uk. 2 December 2008. Retrieved 28 May 2016. ^ "Yale awards 12 honorary degrees at 2014 graduation". Yale News, 19 May 2014. Retrieved 28 May 2016. ^ "Harvard awards 9 honorary degrees", Harvard Gazette, 26 May 2011. Retrieved 28 May 2016. ^ Davies, Caroline (5 October 2016). "New faces on Sgt Pepper album cover for artist Peter Blake's 80th birthday". The Guardian. ^ "Sir Peter Blake's new Beatles' Sgt Pepper's album cover". BBC. 2 April 2012. Retrieved 9 November 2016. ^ "Sir Tim Berners-Lee Receives Inaugural Queen Elizabeth Prize for Engineering, 2013". Web foundation.org. ^ "DRM concerns arise as W3C's Tim Berners-Lee approves the EME specification". SD Times. Retrieved 12 March 2019. ^ "Tim Berners-Lee just gave us an opening to stop DRM in Web standards". Defective by Design. Retrieved 12 March 2019.